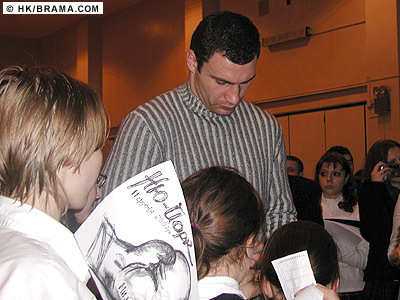 New York, Dec. 11  Two days ago, the students of St. George School and Academy were disappointed when the expected appearance of super athletes Volodymyr and Vitali Klitschko did not take place. But today, that disappointment was turned into radiant joy. The boxing duo made a special effort to fit a visit to the school into their hectic schedules, and turned up despite the inclement weather. 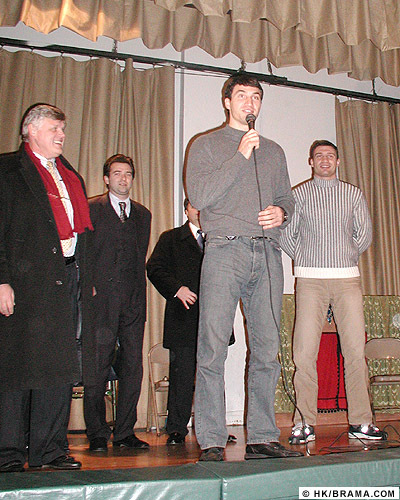 The schoolchildren were all smiles when their heroes strode out on the auditorium stage and let out a cheer that must have been heard throughout Manhattan. 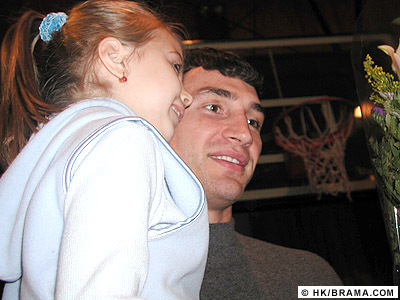 On stage, the Klitschko's looked as much surprised as they were pleased by the warm reception given by the students. 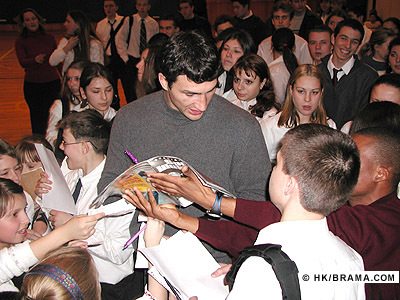 The brothers took extra time out to sign as many autographs as humanly possible, and urged the kids to diligently pursue their studies. 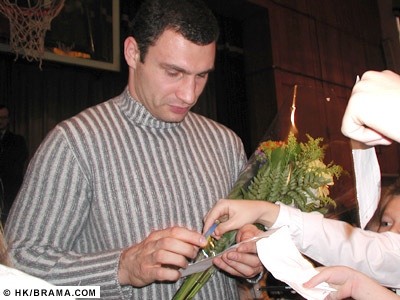 New York, Dec. 11  Volodymyr Klitschko holds a young student in his arms after receiving a bouquet of flowers. 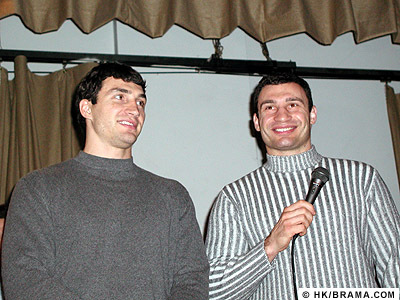 New York, Dec. 11  A good education is the key to the future, said the brothers Klitschko to the students. 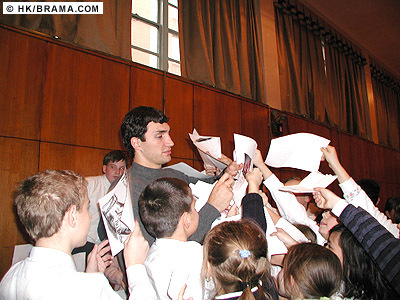 Students were quick to hand a pen to Vitali for his autograph. 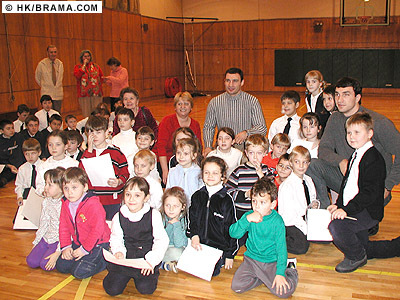 Each class posed for a group picture with the Klitschko brothers. Consul General Serhiy Pohoreltsev bids farewell. 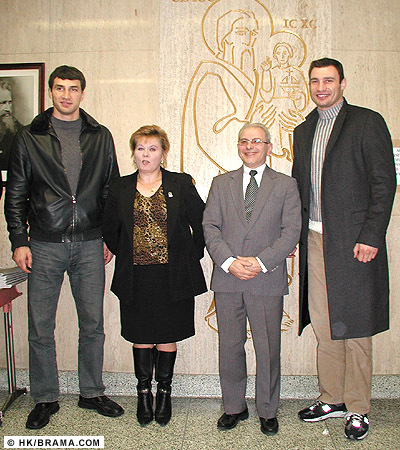 St. George School administrators Irene Saviano and Peter Shyshka pose with the Klitschko's. 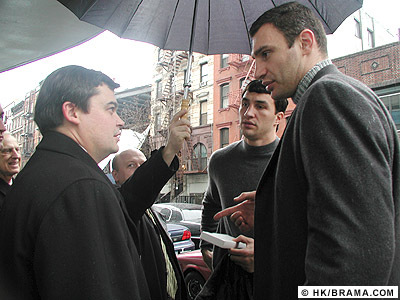 Basil Danchuk (left) for the Ukrainian Institute of America and the Consulate of Ukraine in New York coordinated the St. George event with Volodymyr and Vitali Klitschko.